BetterBack allows you to effortlessly sit in perfect posture while easing back pain—and preventing it. 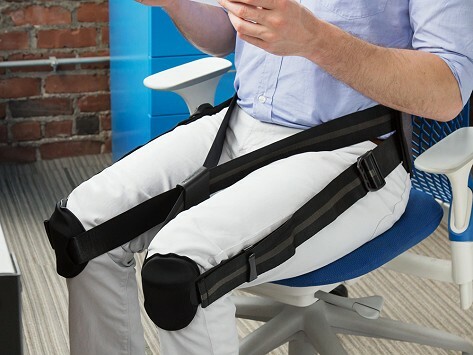 This lightweight, portable posture device and lumbar support helps train you to sit up properly at work or at home in as little as 15 minutes a day. It works just as well (and as comfortably) as an on-the-go ergonomic seat support, even on a stool or bench or when traveling. Dimensions: Waist up to 36": 12" x 10" x 3"; Waist 36" to 55": 17" x 14" x 4"
Weight: Waist up to 36": 1.2 lbs. ; Waist 36" to 55": 2.4 lbs. issues. Thank you for this great product. As a person who has worked on her posture and biomechanics for years, I find this HUGELY helpful. I know how to sit, but this device helps me hold that proper sit for long periods and develop the inner strength and awareness to hold it without the device! I actually have bought additional ones for family members because I think it is so helpful. BetterBack combines a posture trainer and an ergonomic support in one flexible and portable design. It’s the creation of Maker Katherine Krug, who worked her way through just about every type of treatment trying to quell sciatic back pain when she finally had her a-ha moment. Instead of focusing on pain relief, she realized she needed to practice proper alignment to feel better. When friends kept borrowing Katherine's early prototype of BetterBack—consisting of recycled plastic containers and a whole lot of tape—she knew others would appreciate a posture trainer and lumbar support that helps you sit up correctly. BetterBack helps stabilize your pelvis to get your spine into the proper (natural) alignment. The lightweight device is adjustable and cushioned for comfort as it turns any seat into an ergonomic one, even a stool or bench. Try a 15-minute session each day to work on sitting up straight, so all of you can feel better.